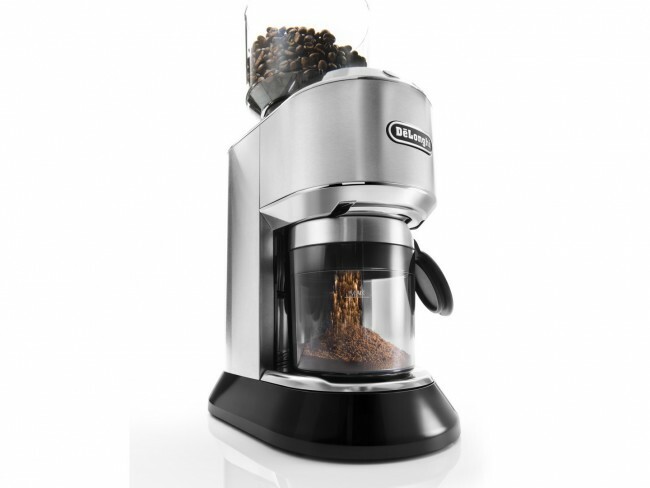 Skip the pre-ground coffee: go for the grind with the DeLonghi Dedica Grinder. Designed to accompany the Dedica espresso machine, the Dedica grinder sports the same slim shape and stainless case as its larger counterpart. A stepped collar grind adjustment allows for easy changes from coarse settings, like drip coffee and pour overs, to espresso grinds. 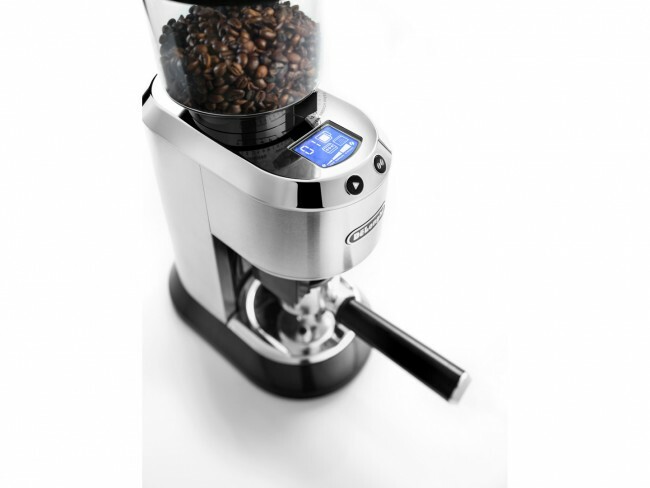 The Dedica grinder comes with options for either, allowing you to grind directly into your portafilter or into the included grounds catch bin. Controls are equally flexible, switching between coffee and espresso dosing options whenever you attach the portafilter holder. Portafilter or Bin - The Dedica grinder includes both a portafilter holder attachment and a grounds bin. Dose Programming - Set either the number of cups for regular coffee or grind time for espresso shots. Stepped Grind Adjust - Select from 18 different grind settings between French press and portafilter. Power-saver Mode - The Dedica grinder packs in programming that powers down the screen after 15 minutes of inactivity. Tool-less Removable Burr - Pop out the top burr with a quick twist for easy cleaning. 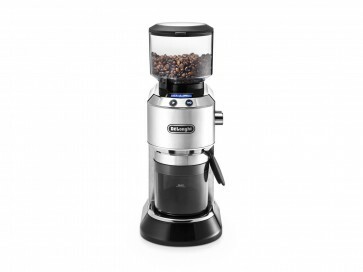 Match-match - This grinder makes quite a pair alongside the Dedica and Dedica Deluxe. Mode Swap - The auto-swap modes when attaching the portafilter holder is a nifty trick! A Little Little - The Dedica grinder's portafilter holder is sized for the Dedica's diminutive portafilter, and will likely not fit a 58mm portafilter. We recommend the Dedica grinder for pressurized portafilters only, though a few people have reported that it works okay for non-pressurized baskets. Out of the box, the portafilter holder needs a little pressure to lock in fully, you'll hear a loud 'click' once it's in place. Wipe out hopper and catch bin between bean refills. Remove top burr and brush out old grounds, or use grindz, as needed—generally monthly. Wipe down case and screen with a soft cloth.